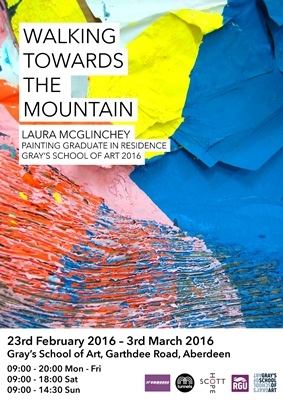 Part painting, part sculpture, is how artist Laura McGlinchey describes her work as she prepares to unveil her first solo show, ‘Walking Towards the Mountain’ at Gray’s School of Art. The 25-year-old, who graduated from Gray’s in 2013 with a First Class Honours degree in Painting, returned to Aberdeen in March 2015 to take up the position of Painting Graduate in Residence. ‘Walking Towards the Mountain’ is the resulting body of work that Laura has created over the course of the year and features large, bold paintings that are concerned with colour and form. The exhibition opens on Tuesday, February 23 and runs until Thursday, March 3. Laura, who was brought up in Troon, is the fifth graduate to undertake the Painting residency at Gray’s. She said: “My work is big and colourful and the pieces that I’ve produced during the residency are monumental but I don’t think I’m trying to actively say anything with them – it is more a fascination with colour and form and things being 3D. “I started using billboard paper in my work because I love walls that have layers and layers of posters on them that have been ripped and pulled down. I just think that is great to look at. That’s where it all started from. “Throughout the residency I’ve definitely been working with different processes – I’m still working with similar materials to but I’ve found better ways of doing it. Laura cites artists Bram Bogart and Mark Bradford as two big inspirations in her work. The graduate in residence scheme at Gray’s provides support to a recent graduate in the early stages of their career by providing them with a studio space and access to other resources such as workshops and IT facilities while assisting with a range of undergraduate activities. Laura added: “I wouldn’t have been at this point if I hadn’t had this time at Gray’s. I made a timeline when I started the residency and thought I would undergo this period of play at the start, discover a solution and then make the Paintings. “Actually, I feel like I’ve been playing and trying new things for the whole residency which has been really useful and I now have all these things that I have resolved. Having the time and space to do that has really helped. Keith Grant, painting course leader at Gray’s, said: “Laura’s student work, and in particular her Degree Show, straddled the dividing line between Painting and Sculpture. “In fact, this has always been one of her real strengths, the exploration of the tension between two and three dimensions. “The work that she has produced for this, the fifth Painting Graduate in Residence exhibition, has taken that relationship to a new level and I hope that people enjoy this exciting new body of work”. 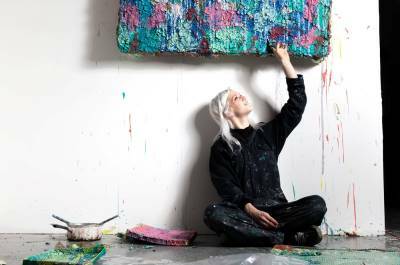 Laura, who is a member of the Glasgow based Visual Artist Unit (VAU), was selected for the Royal Scottish Academy’s annual New Contemporaries exhibition in 2014 where she won the RSA Art Prize alongside the Maclaine Watters Medal and has also shown work at the Fleming Collection in London. ‘Walking Towards the Mountain’ is on display at Gray’s School of Art, Garthdee Road, Aberdeen from Tuesday, February 23 to Thursday, March 3. Opening hours are 9am to 8pm Monday to Friday, 9am to 6pm on Saturday, and 9am to 2.30pm on Sunday.